To Cite: Mohammadi Abandansari R, Parsian H, Kazerouni F, Porbagher R, Zabihi E, et al. Effect of Simultaneous Treatment with Royal Jelly and Doxorubicin on the Survival of the Prostate Cancer Cell Line (PC3): An In Vitro Study, Int J Cancer Manag. 2018 ; 11(4):e13780. doi: 10.5812/ijcm.13780. Background: Doxorubicin (DOX) therapy is the first step in the treatment of several malignancies such as prostate cancer. Drug resistance is the main drawback of this agent. Royal jelly (RJ), used to prevent or cure many diseases, is a substance produced by honey bee. Objectives: The aim of this study was to determine the cytotoxic effect of DOX and RJ on prostate cancer cells, PC3. Methods: Cell viability of the three experimental groups (RJ-treated cells, DOX-treated cells and RJ followed by DOX-treated cells) was assessed by 3-(4,5-dimethylthiazoyl-2-yl)-2,5-diphenyltetrazolium bromide (MTT) assay. Results: RJ-treatment increased the cytotoxic effect of DOX on PC3 cells. Namely, the effect of low dose of DOX in combination with RJ was approximately similar to that of high dose of DOX without RJ combination. Conclusions: Any natural substances that amplify the cytotoxic effect of DOX and have the potential to save normal cells can be potentially used as a therapeutic agent which can decrease the side effects of DOX-treatment. RJ has shown to play this role in the present study. Prostate neoplasm is one of the most common cancers in the world and the second cause of cancer-related death among American nation (1). Unfortunately, this malignancy is usually diagnosed at metastatic stage, when the treatment is very difficult or impossible (2). Endocrine therapy is the first step of treatment in prostate cancer. Chemotherapy is the alternative treatment when hormone therapy is not effective. Metastatic prostate cancer is highly resistant to treatment with cytotoxic agents (3). Doxorubicin (DOX) which is frequently used for prostate cancer treatment is one of the cytotoxic agents. DOX classified as an anthracycline antibiotic with antineoplastic activity was first extracted from Streptomyces peucetius var. caesius in the 1970s and is now being routinely used in the treatment of a large number of carcinomas and malignancies (4). DOX affects cancer cells via two mechanisms: by intercalating into DNA and disrupting the topoisomerase-II-mediated DNA repair or generation of free radicals, and by damaging the cellular membranes, DNA and proteins. These two mechanisms are well-known pathways of DOX action. Although DOX is a valuable clinical antineoplastic agent, its application is limited since the neoplastic cells/tissues quickly become resistant to it (5,6). Therefore, finding a suitable alternative for DOX is highly necessary. It has been proposed that Royal Jelly (RJ) has benefical effects on treatment of some malignancies such as leukemia, breast cancer and prostatic neoplasm (7,8). RJ is secreted from the glands on top of the young nurse bees' heads. It contains significant amounts of proteins and minerals which are important for cell growth and proliferation (9,10). RJ has a complex composition of proteins, amino acids, fatty acids (mostly 10-hydroxy-2-decanoic acid), sterols, phenols, sugars, minerals and other components (11,12). The three unique and major components (10- hydroxy-2-decenoic, 3,10 dihydroxydecanoic and sebacic acids) of RJ are responsible for its role in modulating the function of estrogen receptor, both in vitro and in vivo (13,14). Some studies have reported that honey with RJ clearly affects the renovation of the ovary, enhances the hormonal balance and prevents the hormonal disorders (15). Furthermore, it has been illustrated that RJ effectively improves the peripheral blood mononuclear cells (PBMCs) proliferation, while it is cytotoxic for K562 cell line in leukemia (16). Moreover, it has been reported that RJ is able to act as antiproliferate agent on breast cancer cells MCF7 that are stimulated to proliferate by bisphenol A (BPA) (10). It has also been suggested in 2013 that the treatment of PC3 cell line with various concentrations of GE132 + Natural extract (consisting Reishi mushroom, RJ, Resveratrol, Lycopene and Sulforaphane) effectively inhibited proliferation of this cell line (13). The aim of this study was to determine the effect of simultaneous treatment of PC3 cell line with DOX and RJ on cell viability and to investigate whether this natural substance is able to increase the cytotoxic effect of DOX on PC3 cell line. This basic-applied study was an in vitro study which was conducted on cell lines. The study started in January and finalized in April 2017. The ethical committee of Shahid Beheshti University of Medical Sciences approved the study (ethical number: Ir.sbmu.ram.rec.1394.376). Ten milligrams doxorubicin hydrochloride (DOX.HCl) powder (purchased from Sigma Aldrich, D1515) was dissolved in 1 mL of sterile distilled water (S.G.CO 5 mL-Iran- Tabriz). Crude RJ was purchased from bee keepers of Iran, Mazandaran. Ten grams of RJ was dissolved in phosphate buffered saline (PBS) (final volume: 10 mL) to make 1000 mg/mL stock concentration. This mixture was then centrifuged at 10000 revolutions per minute (RPM) for 30 minutes. The supernatant was passed through a 0.2 micron syringe filters and was then stored in 2 mL Eppendorf tube at 20°C until being used for experiments. PC3 cells were provided by the Pasture Institute (Tehran, Iran) and cultured in Roswell Park Memorial Institute (RPMI) 1640 culture medium (Biowest L0500 - 1000) containing 15% fetal bovine serum (FBS) (Biowest L1820 - 100) and penicillin-streptomycin 1% (Sigma P4333 - 100 mL). The cells were maintained at 37°C in a humidified incubator (New Brunswick, Eppendorf company-Galaxy170R) supplemented with 5% carbon dioxide (CO2). 100% of confluent cells were collected and seeded at a density of 10,000 cells in 96-well plates. The PC3 cells were plated in three different 96-well plates in triplicate. The culture medium was removed after 24 hours before starting the intervention. The cells in the first group were incubated with various concentrations of DOX (100, 10, 1, 0.1, 0.01 µg/mL) for 48 hours, which were diluted in culture medium, prior to measuring the cell viability. PC3 cells in the second group were treated with serial concentrations of RJ (100, 50, 25, 12.5, 6.25, 3.125 mg/mL) for 72 hours in order to evaluate the cytotoxic effect of RJ. PC3 cells in the third group were pre-treated with the above-mentioned concentrations of RJ for 24 hours prior to being treated with various concentrations of DOX for 48 hours, before measuring the cell viability. Cell viability was measured using MTT assay by adding 50 µL of MTT solution (5.0 mg/mL) to each well and 4 hours incubation of the plates. The supernatants were carefully aspirated and 150 µL of dimethyl sulfoxide (DMSO) (Sigma D4540 - 100 mL) was added to each well to dissolve the formazan crystals resulted from metabolism of living cells. The absorbance was measured by an ELISA reader (Rayto RT-2100C microplate reader) at 570 nm as the main wavelength and at 630 nm as the secondary wavelength (9). The collected data were analyzed using SPSS21 One-way ANOVA with LSD post-hoc test was used to compare the differences in the effect of the various concentrations of RJ and DOX. P < 0.05 was considered significant. The results of MTT assay have shown that the cytotoxic effect of RJ is both time- and concentration-dependent (Figure 1). As illustrated in Figure 1, hours incubation of PC3 with 100 mg/mL RJ induced the best cytotoxic effect. Based on the data presented in Figure 1 and Table 1, the IC50 value of RJ on PC3 was 50 mg/mL (after 72 hours). 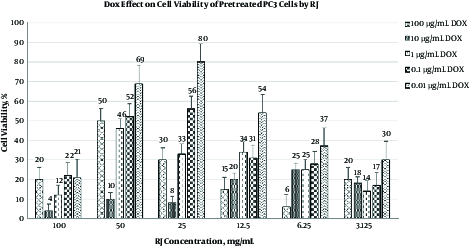 Differences in viability of PC3 cells treated with various concentrations of RJ in three time intervals are illustrated in Table 1. RJ did not affect the viability of PC3 at 25, 12.5 and 3.125 mg/mL after 24 and 48 hours of incubation. On the contrary, higher concentrations of RJ (50 and 100 mg/mL) were able to induce cytotoxic effect on prostate cancer cell line that was used in this study. Figure 1. The cytotoxic effect of RJ on PC3 cells. The cytotoxic effect of RJ was dose-dependent after 72 hours of incubation. The results of MTT assay showed 50% cell viability reduction after 72 hours of incubation with 50 mg/mL of RJ. Data are expressed as mean ± SD. aData are expressed as mean ± SD. 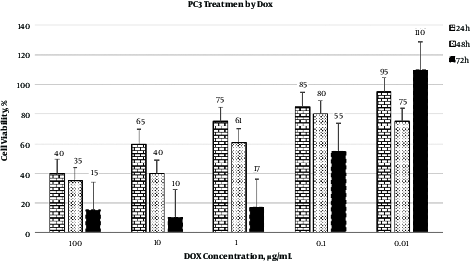 As represented in Figure 2, the best cytotoxic effect of DOX on PC3 cells was observed at 10 µg/mL after 48 hours of incubation. Calculation of IC50 revealed that 0.1 µg/mL of DOX was able to induce cytotoxic effect in 50% of PC3 cells. Figure 2. The cytotoxic effect of DOX on PC3 cells. The cytotoxic effect of DOX on PC3 cells was evaluated in three times interval using MTT assay. Data are expressed as mean ± SD. As shown in Table 2 and Figure 3, in another experimental procedure, PC3 cells were treated with various concentrations of RJ for 24 hours prior to DOX treatment. The results of the present study revealed that the pre-treatment of PC3 cells with RJ led to a reduction in the concentration of the effective dose of DOX used to destroy these neoplasm cells. Therefore, various concentrations of RJ, especially at 100 mg/mL, can improve the cytotoxic effect of DOX. Figure 3. Pre-treatment of PC3 cells with RJ, prior to treatment with DOX. Results indicated that pre-treatment of PC3 cells with RJ led to a reduction in the concentration of the effective dose of DOX used to destroy these neoplasm cells. Data are expressed as mean ± SD. aComparison between the groups was performed using ANOVA, LSD as post-hoc test. Data are expressed as mean ± SD. Chemotherapy is widely used for cancer treatment; however, the side effects of chemotherapy agents, the damages induced by them to the normal cells and tumor cells resistance to these agents are the major limitations of this treatment method. Therefore, finding more effective substances is required to overcome these limitations. The aim of the current study was to determine the simultaneous effect of RJ, as a natural substance, and DOX on viability of the PC3 cells. Furthermore, the capability of RJ to increase the cytotoxic effect of DOX on this cell line was investigated in the present study. The results of this study demonstrated that the cytotoxic effects of RJ were both dose- and time-dependent. Moreover, the best cytotoxic effect of RJ on PC3 cells was detected at the concentration of 100 mg/mL after 72 hours of incubation. In addition, it was found that the best cytotoxic effect of DOX was induced at the concentration of 10 µg/mL. Furthermore, pre-treatment of PC3 cells with various concentrations of RJ enhanced the cytotoxic effects of DOX at lower doses. Previous studies have evaluated the anti-environmental estrogen activity of RJ. It has been suggested that RJ inhibits the growth-promoting effect of Bisphenol A (BPA), as an environmental estrogen, on MCF7 cells and concluded that RJ can disturb the estrogen-induced cells proliferation signals (10). Another study in 2013, investigated the anti-proliferative activity of GE132 + Natural (which consists of Reishi mushroom, Royal jelly, Resveratrol, Lycopene and Sulforaphane) in some cell lines, including MCF7, SW480 (colon cancer cells), PC3 and EA.hy 926 (normal human endothelial cell line). It was found that GE132 + Natural acts as an anti-proliferative agent on cancer cell lines in a dose-dependent manner; however, it does not induce the same effect on the primary mesenchymal stem cells. Based on the findings of the present study, combination of RJ with the above-mentioned material can be used to prevent the cancer cells division (13). In a study, the anti-mutagenic effect of RJ on DOX cytotoxicity was investigated and the rats were pre-treated with RJ for ten days. It was shown that this pre-treatment was effective against mutagenic properties of DOX (17). According to the findings of the present study as well as the previous studies, it seems that RJ can be used as a cytotoxic agent for cancer treatment. It has been reported that 10-hydroxy-decenoic acid is one of the major organic acids in RJ composition (11,18). It seems that the anti-tumor activity of whole RJ is attributed to this organic acid (14,18). In 2010, in another study, three organic acids were isolated from this natural substance i.e. 10-hydroxy-2decenoic-10H2DA,3,10-dihydroxydecanoic-3,10DDA and sebacic acid (14). Moreover, in the above study, the effects of these organic acids were evaluated on viability of cancer cell lines and it was found that although these medium chain fatty acids were not structurally similar to estrogen, they could block or down-regulate cells proliferation signals via modulation of ERα, ERβ and their co-activators to the target genes (19). According to the results of this study, the best effectiveness was detected when RJ at the concentration of 100 mg/mL was administered along with DOX at a concentration of 10 µg/mL. One of the major limitations of clinical administration of DOX administration is its dangerous side effects on human cells as well as neoplastic cell resistance. The results of the present study have demonstrated that the combination of RJ and DOX can be considered as a novel approach in order to administer lower concentrations of DOX, which may help to reduce or prevent the side effects of DOX on human cells. However, further clinical studies are required to clarify the exact efficiency of combination of this natural substance and DOX. The aim of the current study was to compare the prostatic cell lines survival during the exposure to DOX and RJ alone, and their simultaneous effect on the survival rate. Results showed that the simultaneous treatment of PC3 cells with RJ and DOX could improve the cytotoxic effects of DOX. These results indicate the possibility of clinical administration of lower doses of DOX along with RJ instead of higher doses of DOX. This may allow physicians to reduce the dose and ultimately the side effects of DOX and improve the process of remedy. The authors would like to thank Dr. Mehrnoosh Shanaki, assistant professor of Shahid Beheshti University of Medical Sciences, for her helpful cooperation and critical revision of the manuscript for important intellectual content and administrative, technical, and material support. Authors’ Contribution: Study concept and design, Rouzbeh Mohammadi Abandansari, Ali Rahimipour, Hadi Parsian; acquisition of data, Rouzbeh Mohammadi Abandansari; drafting of the manuscript, Rouzbeh Mohammadi Abandansari; critical revision of the manuscript for important intellectual content, Ali Rahimipour, Hadi Parsian, Farank Kazerouni; administrative, technical, and material support, Ali Rahimipour, Hadi Parsian, Faranak Kazerouni; study supervision, Ali Rahimipour. Conflict of Interest: There is no conflict of interest in this article. Financial Disclosure: This research has funded by a grant from Shahid Beheshti University of Medical Sciences. 1. Jemal A, Siegel R, Xu J, Ward E. Cancer statistics, 2010. CA Cancer J Clin. 2010;60(5):277-300. doi: 10.3322/caac.20073. [PubMed: 20610543]. 2. van Brussel JP, van Steenbrugge GJ, Romijn JC, Schroder FH, Mickisch GH. Chemosensitivity of prostate cancer cell lines and expression of multidrug resistance-related proteins. Eur J Cancer. 1999;35(4):664-71. [PubMed: 10492644]. 3. Van Brussel JP, Jan Van Steenbrugge G, Van Krimpen C, Bogdanowicz JF, Van Der Kwast TH, Schroder FH, et al. Expression of multidrug resistance related proteins and proliferative activity is increased in advanced clinical prostate cancer. J Urol. 2001;165(1):130-5. doi: 10.1097/00005392-200101000-00032. [PubMed: 11125381]. 4. Devaraj S, Moffett BS. A Guide to Therapeutic Drug Monitoring. 2015. 5. Thorn CF, Oshiro C, Marsh S, Hernandez-Boussard T, McLeod H, Klein TE, et al. Doxorubicin pathways: pharmacodynamics and adverse effects. Pharmacogenet Genomics. 2011;21(7):440-6. doi: 10.1097/FPC.0b013e32833ffb56. [PubMed: 21048526]. 6. Sanchez C, Mendoza P, Contreras HR, Vergara J, McCubrey JA, Huidobro C, et al. Expression of multidrug resistance proteins in prostate cancer is related with cell sensitivity to chemotherapeutic drugs. Prostate. 2009;69(13):1448-59. doi: 10.1002/pros.20991. [PubMed: 19496068]. 7. Mofid B, Rezaeizadeh H, Termos A, Rakhsha A, Mafi AR, Taheripanah T, et al. Effect of Processed Honey and Royal Jelly on Cancer-Related Fatigue: A Double-Blind Randomized Clinical Trial. Electron Physician. 2016;8(6):2475-82. doi: 10.19082/2475. [PubMed: 27504161]. 8. Premratanachai P, Chanchao C. Review of the anticancer activities of bee products. Asian Pac J Trop Biomed. 2014;4(5):337-44. doi: 10.12980/APJTB.4.2014C1262. [PubMed: 25182716]. 9. Musa M, Nasir NF, Thirumulu KP. 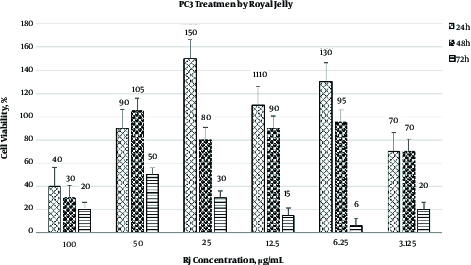 Evaluation of royal jelly as an alternative to fetal bovine serum in cell culture using cell proliferation assays and live cell imaging. Afr J Tradit Complement Altern Med. 2014;11(1):148-55. doi: 10.4314/ajtcam.v11i1.23. [PubMed: 24653569]. 10. Nakaya M, Onda H, Sasaki K, Yukiyoshi A, Tachibana H, Yamada K. Effect of royal jelly on bisphenol A-induced proliferation of human breast cancer cells. Biosci Biotechnol Biochem. 2007;71(1):253-5. doi: 10.1271/bbb.60453. [PubMed: 17213647]. 11. Garcia-Amoedo LH, Almeida-Muradian L. Physicochemical composition of pure and adulterated royal jelly. Química Nova. 2007;30(2):257-9. doi: 10.1590/s0100-40422007000200002. 12. Sabatini AG, Marcazzan GL, Caboni MF, Bogdanov S, Almeida-Muradian L. Quality and standardisation of royal jelly. J ApiProd ApiMed Sci. 2009;1(1):1-6. doi: 10.3896/ibra.4.1.01.04. 13. Okic-Djordjevic I, Trivanovic D, Krstic J, Jaukovic A, Mojsilovic S, Santibanez JF, et al. GE132+Natural: Novel promising dietetic supplement with antiproliferative influence on prostate, colon, and breast cancer cells. J BUON. 2013;18(2):504-10. [PubMed: 23818369]. 14. Moutsatsou P, Papoutsi Z, Kassi E, Heldring N, Zhao C, Tsiapara A, et al. Fatty acids derived from royal jelly are modulators of estrogen receptor functions. PLoS One. 2010;5(12). e15594. doi: 10.1371/journal.pone.0015594. [PubMed: 21203528]. 15. Mahmoud K, Anas T. The role of honey with royal jelly in protecting the graafian follicles from the toxicity of the adriamycin drug. Int J Pharm Pharm Sci. 2015;7(4):376-85. 16. Hosseini S, Delerezh N, Afzal Ahangaran N. The effects of royal jelly on in-vitro cytotoxicity of K562 cells and peripheral blood mononuclear cells. Armaghane Dnesh. 2014;18(11):869-78. Persian. 17. Samia A. E. F , Othman E. O , Esraa A. B , Soheir A. A. E . The protective role of royal jelly against mutagenic effect of adriamycin and gamma radiation separately and in combination. Trends Appl Sci Res. 2008;3(4):303-18. doi: 10.3923/tasr.2008.303.318. 18. Melliou E, Chinou I. Chemistry and bioactivity of royal jelly from Greece. J Agric Food Chem. 2005;53(23):8987-92. doi: 10.1021/jf051550p. [PubMed: 16277392]. 19. Townsend GF, Brown WH, Felauer EE, Hazlett B. Studies on the in vitro antitumor activity of fatty acids. IV. The esters of acids closely related to 10-hydroxy-2-decenoic acids from royal jelly against transplantable mouse leukemia. Can J Biochem Physiol. 1961;39:1765-70. doi: 10.1139/o61-195. [PubMed: 13922208].